On Feb. 9, the U.S. Supreme Court granted a request to delay enforcement of the U.S. EPA’s Clean Power Plan until legal challenges are resolved. North American overseas pellet exports increased for the second consecutive quarter in the third quarter of 2015, rising 15 percent from the previous quarter to reach a new record high of just over 1.6 million tons. BBI International has announced the agenda for the industry tour taking place April 14 at the ninth annual International Biomass Conference & Expo . 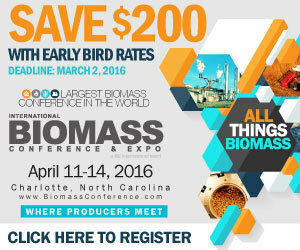 This tour will provide an in-depth look at the biogas industry in Charlotte, North Carolina. On Feb. 11, German Pellets GmbH announced a German court has appointed a provisional insolvency administrator with regard to insolvency proceedings that have been initiated against the assets of the company. The EU recently published additional details pertaining to its in-depth investigation to assess whether the U.K.’s plans to support the conversion of an additional unit of the Drax power plant to operate on biomass are in line with state aid rules. The U.S. Energy Information Administration has released the February edition of its Short-Term Energy Outlook, predicting total renewables used in the electric power sector will increase by 8.1 percent this year. U.K.-based Active Energy Group Plc recently announced the launch of its AEG CoalSwitch division. According to the company, its AEG CoalSwitch technology creates a biomass-based drop-in replacement for coal. Resolute Forest Products Inc. recently released its fourth quarter financial results, reporting its wood products segment generated an operating loss of $8 million in the quarter, but shipments rose 6 percent due to capacity enhancement initiatives. The U.S. Senate is currently considering the Energy Policy Modernization Act of 2015. To date, lawmakers have introduced more than 275 amendments to the bill, including several that would impact biofuels and bioenergy. Floreat Group has committed $50 million to the U.K. biomass sector and launched FCM Bioenergy Ltd., trading as Vesta. Vesta is an energy supply company specializing in providing low-cost, long-term green energy contracts using biomass. Sustane Technologies, a Chester, Nova Scotia-based company that turns municipal waste into fuel pellets and biofuels is receiving a $100,000 seed investment from Innovacorp to take its technology to market. The U.K. government recently announced that the U.K. Green Investment Bank will create a “special share” in the company as part of the process to introduce private capital to the organization.